Last year I was amazed at the number of visitors to http://www.ice-cream-recipes.com/ around 4 July. I have always known that holidays of any kind are great occasions for making homemade ice cream and sharing it with friends and family but a summer holiday is especially so. For some reason, it turns out that 4 July is THE day when Americans want to make their own ice cream more than any other day in the year. So what was the ice cream flavor my visitors were most interested in on 4 July? Yep, you guessed it .... vanilla ice cream. The perennial of all ice creams! Out of 85,000 page views that day, my main vanilla ice cream recipe had almost 20% of that in its own right! I have to admit that vanilla is my favorite ice cream, especially when it's made with a fresh custard (cream) base and using a real vanilla pod. A couple of scoops topped with delicious chocolate sauce and a dollop of fresh whipped cream - what bliss! Here's my custard base vanilla ice cream recipe. 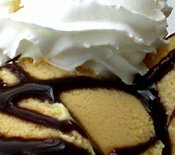 It may seem like hard work on a special holiday to take time out and make some homemade ice cream but it's not that difficult, nor is it too time consuming and the end result is well worth it. You not only get to enjoy the ice cream yourself but you get the pleasure of see all those smiling faces when you hand it out to other people. Whatever you're planning to do this 4 July, have a great time - and if you fancy a bit of homemade ice cream don't hold back. Get to it and enjoy it!